Scrumpy & Western website. Made In Somerset from cider! The Cowshed Cleaners band page. 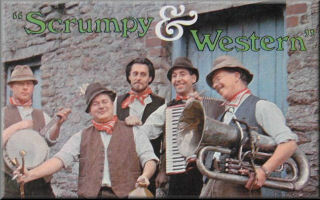 "The Only West Country Group That Smells Like One!" Who Are The Cowshed Cleaners? The Cowshed Cleaners were a Devon-based band from the Tiverton area who described themselves as TV, Radio and Recording Artists. I never saw them on TV or heard them on the radio, but I have found a couple of their albums. Otherwise, I know hardly anything about 'em - if you can help with information about The Cowshed Cleaners? Wurzel Morrell - vocals, washboard, drum, tambourine, hammer and nails. The above line-up was that at the time of their 1979 album 'Eaps More. On the earlier album Springtime In The Farmyard there were three extra band members known as Sheepdip, Thatcher and Smelly Westlake. If you know any more about these characters, please let us know!